MapleStory 2 is only just finishing its second month of service, but we've been making so many changes to the core systems that we need a special post just to cover them all. We've made all of the below changes in response to your valued feedback and harsh-but-fair criticism, and we hope that the below changes make MapleStory 2 the best game it can be. Hard Adventure Dungeons have seen some of the biggest changes, as we work to smooth out the difficulty for players gearing up for Chaos Raids (more on them in a bit). 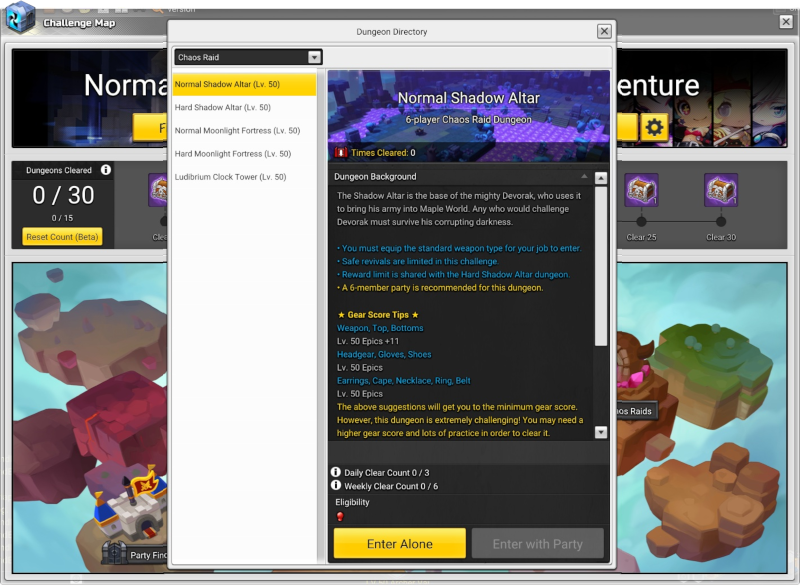 Prior to the Skybound Expansion, all of MapleStory 2's Hard Adventure Dungeons were intended to be roughly the same difficulty, and had identical reward structures to match. The unfortunate result of this was that players seeking to simply hit the Gear Score requirements for Chaos Raids would repeatedly run "The Fire Dragon" dungeon, as it was the quickest and simplest dungeon to complete, causing progression to feel more and more repetitive. Note: It was deemed that the difficulty and complexity of the BeyondLink Tris and Rune Temple dungeons were already above that of the other dungeons, and would not need to be made more difficult. Epic Bonus Re-Rollers allow you to re-roll the values of the bonus stats on the noted type of gear, so that if you find an item with the bonus stats you need, but too low to be useful, you can take another roll and keep whichever numbers suit you best. It takes 6 runs of BeyondLink Tris or Rune Temple to get enough fragments for an Epic Armor Bonus Value Re-roller, and 30 runs for an Epic Weapon Bonus Value Re-roller. Meanwhile, 100 Toad's Toolkit Fragments can be used to create one Toad's Toolkit, an Enchantment Wildcard! These toolkits can be used in place of a copy of the item you're enchanting, making it much easier to get the items you need to upgrade your best gear past +10! ...but we also recognize that the jump in difficulty from Hard Adventure Dungeons to Chaos Raids was too much, and there needed to be a stepping stone to get you to a place where you feel like you have a fighting chance on your first go. The natural solution was to create that stepping stone, renaming the current set as Hard Chaos Raids and creating the new Normal Chaos Raids! Gear Score requirements are the same between Normal and Hard mode. Ludibrium Clock Tower is only available in Hard Difficulty, no easy mode for the clock master! We're also improving Daily Missions, so that you can get more consistent rewards without needing to grind through all the missions every day. With the Skybound Expansion, you will instead gain Weekly Mission Points with every Daily Mission you complete, with the points carrying over day after day. With every 300 Mission Points you earn each week, you'll earn a Gold Mission Complete Box, containing a set array of items; no more needing to pray to the dice for favor. Do your daily missions and you'll be able to pick up the following prizes! That's not all, of course. While the changes to Hard Adventure Dungeons, the addition of Normal Chaos Raids and more reliable Daily Missions are the big headliners, we also have dozens of other changes. Check out the full patch notes below! Channels the power of nature to crush foes! * The Soul Binder uses mystical powers to deal ranged damage and can heal allies. Beginning at level 50, a new chain of quests will appear called "A Fortress in the Skies" that will kick off a new series of Epic quests. Reputation Progression:* "Known" → "Trusted" → "Respected" → "Beloved" → "Revered"
Green Hoods and Lumiknights will give missions from the start. Dark Wind missions unlock when your Green Hoods and Lumiknights reputation becomes Trusted (Lv. 2). Royal Guard missions unlock when your Dark Wind reputation becomes Trusted (Lv. 2). Maple Alliance missions unlock when your Royal Guard reputation becomes Trusted (Lv. 2). A new menu has been added to view the Reputation. 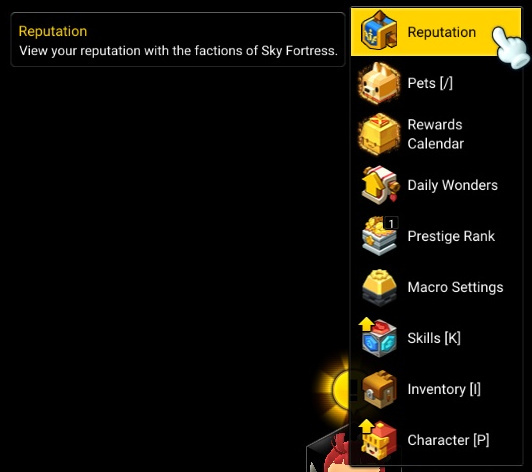 Talk to each of the Faction Captains aboard the Sky Fortress to view the Alliance Shop. * Each Faction will have unique set of items that can be purchased with Faction Tokens. * Some items will require a certain level of reputation before the items can be purchased. A new field boss, CHKY-002, has now been added. New Guild Raid: Xenon System has been added. At Guild level 1, you can now have 60 members. At Guild level 4, it will increase to 70 members. At Guild level 7, it will increase to 80 members. At Guild level 10, it will increase to 90 members. At Guild level 14, it will increase to 100 members. A new 1v1 PVP game mode has been added where you can compete against other Maplers. You must be at least Lv. 50 in order to enter the Arena. Best 2 out of 3 wins the match. Various stats and Arena-based armor and equipment will be balanced to even out the playing field. Valor Tokens will be given as rewards that can be used in the Arena Shop. Adventurers Lv. 50 and above can queue for a match in the Maple Arena menu. The match-making system gathers all queued adventurers in 4-minute intervals and pairings will be determined by your Match-making Rating. If you are matched and decline to enter, a penalty will be applied and you will be unable to queue for 30 minutes. If you check the "Spectator Notifications" box queuing, you will instead be invited to spectate the match between the two highest rated players queued. Best two rounds of three, with each round lasting 120 seconds. You win the round when the opponent's health reaches 0, or by having the most health when the round ends. All buffs will be removed and only your character's skills can be used during the match. Skill cooldowns reset at the start of each round. 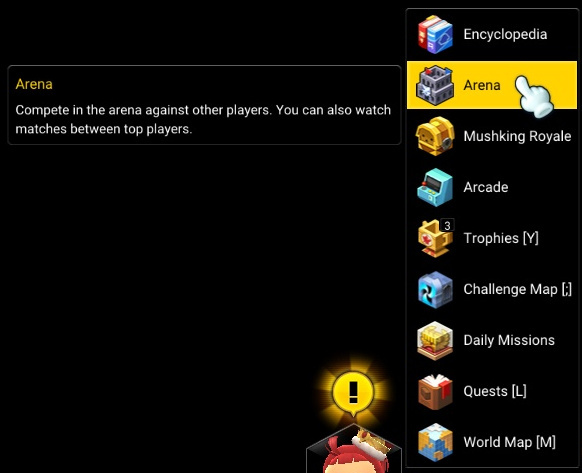 There are 10 arena maps and the arena will be selected randomly. The health of players are adjusted in Maple Arena to better fit the 120 round duration. Increased attack from enchantment on regular equipment will be scaled down significantly, making increased Gear Score from the enchantments meaningless in Maple Arena. This is to ensure that PvP is about players' ability, not what equipment they've earned from other game modes. Pets can't be summoned, and attribute increases from gemstones and most gear effects won't apply in Maple Arena. After a Maple Arena match, your Ladder Score (scores players can view) increase or decrease based on your performance. Ladder Score can't go below 1,000. The following ranks are given to characters based on the Maple Ladder Score. You get more Valor Tokens the higher your rank! PvP gears cannot be dismantled nor enchanted, nor gain sockets for gemstones. "Heavenly Wings" will no longer move you to the closest ally within range, as it had an unfortunate habit of pulling the Priest into lava. * Instead, you can now choose the direction you move towards. An unintentional nerf that reduced the DoT duration of the Priest's "Celestial Light" from 8 to 6 sec will be reverted to 8 sec. "Ice Spear" range in the tooltip is 8 m, but the actual range is short at 7.5 m. The skill will be changed to 8 m to match the tooltip description. Note:*The projectile looks like it's flying more than 8 m and will be changed to fly only 8 m.
"Mana Claw" range in the tooltip shows 9 m, but actual range is short at 8 m. The skill will be changed to 9 m to match the tooltip description. Knockback distance at 150 and 'Knockback' time at 0.3 s.
Knockback distance at 200 and 'Knockback' time at 0.1 s.
Knockback distance at 100 and Knockback time at 0.1 s.
The Fire Dragon and Labyrinthine Halls Gear Score requirements will decrease from 2100 to 1800. Temple of Immortals and Lubelisk Gear Score requirements will remain the same at 2100. BeyondLink Tris and Rune Temple Gear Score requirements will increase from 2100 to 2800. The bosses in The Fire Dragon and Labyrinthine Halls will now have 10\% less health and 25\% lower attack power. As previously introduced and discussed in*Producer Blog - State of the Game Week 7 - Part 2, an experimental event will be added. This item will be tagged as "Event" item during the duration of this event. * The item will expire on January 31, 2019 at 23:59 UTC. The Toad's Toolkit is an item that can be used in place of sacrificed item (weapon or armor) when enchanting an item higher than +10. This item can only be used on an Epic or higher quality item. Chaos Raid [Normal] "Shadow Altar"
Chaos Raid [Normal] "Moonlight Fortress"
Recommended number of players is 6 people. Chaos Onyx Crystals and Onyx Crystals received from the Normal and Hard Adventure Bonus Boxes will now be account bound. Note:*Chaos Onyx Crystals and Onyx Crystals received from Daily Mission Rewards or when dismantling "Enchanted" gear will be character bound. At level 50, the maximum amount of Chaos Onyx Crystals received from the Normal/Hard Adventure Bonus Box will now increase from 10 to 43. At level 50, the maximum amount of Onyx Crystals received from the Normal/Hard Adventure Bonus Box will now increase from 3,680 to 8,500. It was unintended that the Fairfight mechanic was applied in the Tronix Bunker Normal Adventure Dungeon when dealing damage to the mini bosses using EMP Bombs. * This will be removed. Fairfight was accidentally removed from the World Bosses: Ureus, Acreon, and Amadon in Karkar Island, but it will be reapplied. Gold Mission Complete Box will be given at 300 MP / 600 MP / 900 MP weekly. 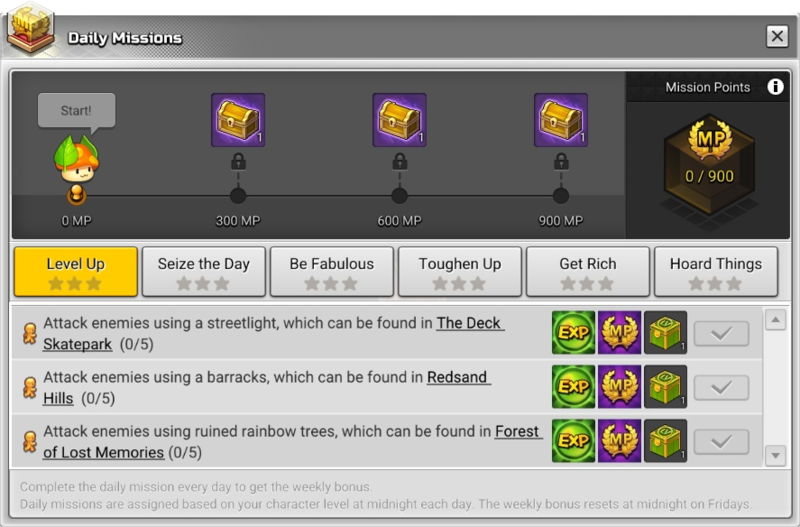 This means completing 30 missions a week will give you all three Gold Mission Complete Boxes. Please note that below fixes may or may not have direct impact on your playing experiences. We are reviewing as many cases as possible and will be continuously be adding optimization tweaks. Voice over change has been applied to Joddy. An update to the Style Crate and Coin Shop! You can find the items that are departing the Style Crate and Coin Shop to make room for the new entries here. The Holiday Uproar: A new Story Event where you can help a sad little girl enjoy the season! Skybound Celebration: Join us as we celebrate the massive expansion with a ton of goodies, including a potion to jump a character up to Lv. 60! Schwanda's Holiday Gallery: Complete tasks throughout the Merry Village and Maple World for a wealth of consumables and two special, event-exclusive prizes! Holiday Dance Dance Stop: A seasonal edition of Dance Dance Stop with festive decoration prizes! December Daily Rewards: Log in to MapleStory 2 during the holiday season to get special prizes, including an adorable Reindeer outfit! Double Guild Saturdays: Starting December 15th, get double the Guild Funds and Experience from Guild Quests on Saturdays! Profanity filter for Portuguese and German will now properly censor inappropriate words. Fixed issue where the Assassin tutorial had to be restarted when logging in again after getting disconnected in a certain situation. The Princess Swing and Rose Wedding Fence is now purchasable regardless of which house template chosen. The trophy, "Scent of Lavender" will now properly complete after conditions are met. An issue has been resolved where players were able to fall off and get stuck on the ledge*in the boss room of Tronix Bunker. 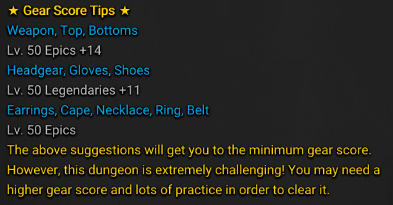 The "Dungeon Cleared" tooltip will now correctly display that you will get items rewards for the first 15 dungeons instead of for the first 10 dungeons cleared. Fixed a display issue where it shows that multiple gathering buffs can be stacked is now corrected when it's not supposed to. Bonus Re-Rollers allow you to re-roll the types and values of the bonus stats on the noted type of gear, so that if you'd like a second chance at getting better types of attributes on your enchanted gears, you can re-roll using these and keep or discard re-rolled bonus stats. *It takes 30 runs of BeyondLink Tris or Rune Temple to get enough fragments for an Epic Weapon Bonus Re-roller. Bonus Value Re-Rollers allow you to re-roll the values of the bonus stats on the noted type of gear, so that if you find an item with the bonus stats you need, but too low to be useful, you can take another roll and keep whichever numbers suit you best. It takes 6 runs of BeyondLink Tris or Rune Temple to get enough fragments for an Epic Armor Bonus Value Re-roller. Meanwhile, 100 Toad's Toolkit Fragments can be used to create one Toad's Toolkit, an Enchantment Wildcard! These toolkits can be used in place of a copy of the item you're enchanting, making it much easier to get the items you need to upgrade your best Epic gear past +10! The Toad's Toolkit is an item that can be used in place of sacrificed item (weapon or armor) when enchanting an Epic*item higher than +10. This item can only be used on an Epic item. Chaos Onyx Crystals received from the Normal and Hard Adventure Bonus Boxes will now be account bound. Skybound Celebration: Join us as we celebrate the massive expansion with a ton of goodies, including a potion to jump a character up to Lv. 50! Note: This previously stated that the potion boosted a character to Lv. 60. We apologize for the error.